By Edward J. Cronin, Jr. It is with mixed emotions that I write to announce that I will retire at the end of this year at which time I will have completed my 14th year as Chief Executive Officer of AHRA: The Association for Medical Imaging Management. It has been richly rewarding to be a part of the remarkable AHRA community, and an honor and a privilege to lead this association over so many years. Working together with all of the great leaders who have served on our Board of Directors, our talented and committed professional staff and, most especially, our wonderful volunteers and members has been the highlight of my career both professionally and personally. I certainly am a lucky man to consider so many of you as friends. I have been working with the board for some time on this and greatly appreciate their understanding and support. We are making this announcement at this time so that they can begin the process of identifying and hiring my successor. Of course, I am completely committed to working diligently to ensure that a smooth transition of leadership will be possible. My wife Carolyn and I have recently purchased a mountain home in the beautiful Asheville, NC area, and we look forward to spending more time together and entertaining our 8 beautiful grandchildren. Leaving AHRA will be difficult, but we are excited about the possibilities the future holds for us. In closing, I would like to express my sincere appreciation for the faith you have shown in allowing me the privilege to serve as your CEO. I am sure the next 9 months will go by very quickly, but I hope to be able to connect with as many of you as possible during that time. 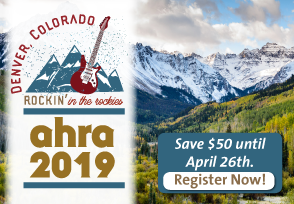 Our slogan, “We Are All In This Together,” has always been very personal for me, and I know you will continue that wonderful culture that makes AHRA such an exceptional organization. p.s. See you in Orlando for AHRA 2018! Thank you for all you have done for the organization, the profession and for me. I have greatly enjoyed and benefited from our friendship. Your retirement is well earned. GOD Bless. See you in Orlando. Thank you Ed. Enjoy because you deserve it. I am sure your successor will benefit from your legacy. Please thank your family for sharing you work us for all of this time. Ed thanks for all your good work. Your successor will have big shoes to fill. Enjoy your time with your family. Take good care. Thank you for your incredible leadership and passion for our industry. It’s been an honor to know you and wish you the best in your retirement. Can’t wait to see you in Orlando !! Thank you for everything you do and have done for this industry over your entire career. You definitely trailblazed a pathway for current and future leaders! It is an honor to know you. Best wishes in your future endeavors and congratulations on a well deserved retirrment! Ed I almost shed a tear when I read this. You were the one that got me involved in the AHRA, nominated me for the board initially and supported me along the way. You are an outstanding person and leader as well as a friend. Thank you for all you have done for the organization. I hope you enjoy you well deserved retirement. I will miss you. It has been a pleasure getting to know and work with you Ed! Thank you for everything you’ve done for AHRA! We’ve had so much success under your leadership. You will be deeply missed but forever a part of our AHRA family! I wish you the best in this next stage of life! It sounds like you have a beautiful place in North Carolina and I know how much you are looking forward to spending more time with your family. Congratulations Ed. You have been a great leader for the organization. It has been my pleasure to work along side you on the AHRA Board, and the EF Board. Enjoy the last months on the road to the next chapter of your life. Congratulations and well deserved. It’s a very well deserved retirement, just around the corner, and it awaits you Ed, in the not to distant future. But… there is still work to do, people to see, and places to be – all to achieve one final goal…finding the next leader for our wonderful-heartfelt-superconnected- professional-education-leader-driven association. I have full confidence and faith in our current President, Board of Directors and you, to do just that. You have lead, influenced, networked and accomplished so very much in your 14uear tenure with the AHRA and our membership is stronger, our EF Foundation is wealthier, and our educational, advocacy and leadership products and services are all better due to your leadership, managment and involvement for our association membership’s benefit. Thank you, Ed. Well done! I know you are looking forward to retirement in North Carolina, spending quality time with Carolyna ndnyour family. Best wishes on this next endeavor and journey of life for you all. I’ll have more to say on your announced retirement, later, but for now…there is work to do, people to see, and places to be…because success isn’t best measured by how you start the race, what matters most, is how you finish! Ed, it has been a pleasure working with you over the last 8 years – yes the first time we worked together really was the Spring 2011 Conference! I wish you and Carolyn the absolute best in retirement and we all have to make sure that the climax to Orlando is a tremendous retirement party! !